To buy click once on the ‘add to basket’ button alongside the picture of each item. To view the contents of your basket or go to the checkout, click ‘review/checkout’. For more detailed information click the picture or use the text menu in the left hand margin to navigate you to the correct page, you’ll find ‘add to basket’ and ‘review/checkout’ buttons there too. 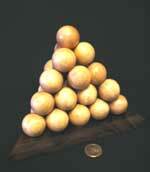 An exceptionally difficult and very large, 35 ball, pyramid. Made up of nine completely differently shaped pieces, this puzzle first introduced in 2005, is one of our most difficult to rebuild. A mathamatical teaser originally invented by a Frenchman over 100 years ago and now often used in school maths lessons and management apptitude tests. A great gift that is sure to challenge everyone. Attempt to place the 16 wooden triangles within the triangular recess of the board so that the colours match those of the adjacent triangles and those marked on the edge of the board. A difficult colour colour combination puzzle where the puzzler must arrange the four different cubes in the frame so that one each of the four colours must appear in a row on all four sides of the frame. There are 2 extra puzzles included. A smaller version of #794 that actually fits into the barrel of some Christmas crackers. An even smaller minature keyring version of #794. Using all seven pieces see if you can find a capital letter ‘M’. Using all six pieces see if you can find a capital letter ‘T’. A dice with a difference. Made up of 9 ‘L’ shaped pieces this ddice forms the basis to two entirely different puzzles. It can be built both as a red and white spotted dice but the white version is much more difficult than the red. To be sucessful you’ll first have to discover why! Constructed from just four pieces, you might be forgiven for thinking that this might be easy but be warned it’s not! A very unusual construction that’ll prove a real challenge for even the most aspiring tomb raider. 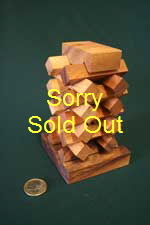 A difficult 20 ball, six piece pyramid puzzle that makes an attractive and challenging talking point. A more complicted version of #805. 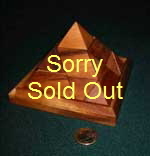 An attractive and moderately diffificult pyramid shaped puzzle assembled from six groups of balls. An extremely good ‘family’ puzzle as suitable for children from 5 years upwards as it is for adults. The object is simple enough, just rotate and arrange the discs so that each line of numbers from top to bottom totals 100. An incredibly addictive puzzle that provides an excellent excuse for some light hearted mental arithmetic. Based upon the famous London landmark at Canary Wharf, once dissembled let’s see how long it takes you to get to the top using mental effort rather than anything mechanical! The tower is built from 19 seperate pieces that you must first take apart and then attempt to rebuild without refering to the architect’s plan. This is an unusual and difficult construction puzzle. A traditional handmade round board 210mm in diameter with glass marble playing pieces and solution included. 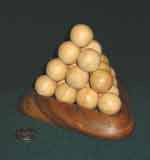 A traditional round board with matching wooden ball playing pieces. 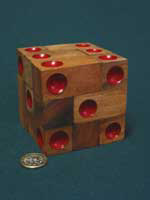 A square board with a matching lid and wooden ball playing pieces. Comes complete with the instructions for Fox and Geese. A square board with 10mm wooden peg playing pieces that in a moving vehicle (car, plane, bus etc.) are less likely to get lost than balls. Comes with a matching lid and instructions for the Fox & Geese game. 4inch square, unlidded board with 7mm diameter playing pieces complete with instructions for the Fox and Geese game. 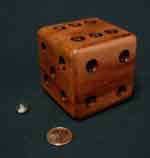 Attempt to release the glass marble trapped inside the dice. It’ll come out of the the number one hole but only if you’ve sucessfully managed to negotiate the maze that runs inside! This is a very tactile and addictive puzzle that some people use as a desk tidy! The nine spotted rectangles will fit together to build a perfectly spotted die. The question is how many ways and how long will it take you, to find just one? #803 TANGRAM 14 PC. PUZZLE & GAME £16.00 The box which has a folding lid, holds two complete sets of Tangram and comes complete with our own excellent Tangram story book ‘TANGRAM TALES’ the solutions for which are given in the second half. A single, 7 piece set of Tangram supplied in a wooden box with lid together with a copy of our ‘TANGRAM TALES’. A smaller version of #799 with a lidded box and a copy of ‘TANGRAM TALES’. A very difficult puzzle, the pieces of which may be assembled into both 2D and 3D forms. Comes complete in a lidded box. Using the 5 pieces supplied build them into a capital letter ‘F’. Using the 6 pieces supplied build them into a capital letter ‘H’. Used as a promotional aid by Hathaway’s bread and given away free with every loaf, it was invented over over a century ago and followed on from the famous ‘T’ puzzle, see # 810 above. Using the 5 pieces supplied build them into a capital letter ‘K’. Using the 4 pieces supplied build them into a capital letter ‘T’. This must be easy musn’t it? First used as an advertisement for Ceylon tea over 100 years ago this is a trully remarkable puzzle that can provide hours of frustrating fun. A solitaire type of puzzle, the objective which is to end up with just the one green piece remaining on the board at the top of the triangle. 4 inch unboxed square board with 7mm playing pieces. Using the L shaped ‘Knight’s’ move, as in a game of chess, swap the position of the 2 sets of pieces in the minimum number of moves possible. Attempt to arrange thel 7 wooden discs within the large circular recess of the board so that the colours match those adjacent. A two piece pyramid that can prove surprisingly tiresome to those that have never seen it before. This makes a great introductory puzzle. A wooden tray, apparently full of differently shaped pieces but lying atop a small red square lies waiting to be added. Your task is to empty all the pieces out of the frame and then see if you can replace them all including the extra small square? A very difficult puzzle that looks fine in the box but what happens if you empty the thirteen, differently shaped, pieces out? Will you ever find a way to get them back together so that the board is perfectly chequered, once more? Two square boards, back to back, one slightly smaller than the other. Attempt to arrange the 4 wooden letter T’s so that they fit flat into both different sizes without overlap or being stood upright. Four solutions possible for one side, just one for the other. A foutteen piece four sided pyramid the rebuilding of which can have even the most experinced Egyptologist scratching their head! A pretty puzzle....difficult and attractive.